Push-pull ventilation for weld fume – an effective control? Here at AES, we work with a large number of customers and potential clients to help them control weld fume. Many of our discussions centre round the merits of different types of local exhaust ventilation including extraction arms, on-torch extraction and down-draft booths. Recently however we have been asked to provide advice for a number of companies who have been offered push-pull ventilation systems for the control of weld fume. As there appears to be little published information on the benefits or otherwise of push-pull systems we thought it would be useful to collate some relevant information from the COSHH regulations and HSE guidance here. Although weld fume as a whole no longer has a Workplace Exposure Limit (WEL), individual chemicals found within weld fume (e.g. Iron oxide fume, manganese, chromium, nickel) have been assigned WELs . In the workplace therefore, weld fume (or the individual components thereof) is governed by the COSHH 2002 regulations. Where the above is not reasonably practical, employers must comply with the secondary duty to control exposure adequately by all routes e.g. by adequate ventilation systems (including LEV). Consideration of application of the secondary duty above is essential, as, in the event of a claim from an employee you would have to demonstrate that you had controlled exposure adequately by all routes. The following two examples demonstrate possible scenarios for different contaminants. In the case of a paint booth, where large items are sprayed, and the contaminant is released over time, Local Exhaust Ventilation (extraction at source) would probably not be practical as the contaminant is being released over a wide area. Instead, general ventilation in the form of a spray booth would be used in conjunction with RPE. In the case of weld fume, the contaminant is being released from a discrete area when the weld is being carried out. Local Exhaust Ventilation can practically be used to extract the fume before it is released into the workplace. General ventilation could also be used but the initial high concentration of fume from the point of weld will be passing through the operators breathing zone before it is diluted meaning that they may be exposed to levels above the workplace exposure limit. It should also be noted that, if only general ventilation is used then all workers in the general area are potentially being exposed to the fume. Can you fit on-gun extraction for semiautomatic processes? Provide a good standard of general ventilation; 5-10 air changes per hour, with a through draught. Provide an extracted welding booth, an extracted workbench or a moveable capture hood. See illustrations. You may also need to use respiratory protective equipment (RPE). Air sampling will help you to decide. See sheet G409. You need an inward air speed between 1 and 1.5 metres per second into a booth. You need an air speed of at least 2 metres per second into an extracted welding bench. It should be noted that the above recommendations do not specify that general ventilation is an alternative to LEV (i.e. bullet point 3) and that it recommends that the area should be well ventilated and LEV should be used. To summarise, as an employer you need to be able to demonstrate that you have followed the COSHH regulations with regards to Risk Assessment and Control of Substances. In the event of a claim, you would be asked to demonstrate how the measures you had taken were in accordance with the law and protected the workers. If general ventilation were to be used only then you would have to demonstrate how you could prove it had been effective (You would have to carry out routine personal sampling and keep these results). With LEV, the proof of effectiveness can be a lot easier (weld fumes are visible and it is easy to see if they are being extracted at source, and you can also put a lot more onus on the employee under COSHH regulation 8 which states that employees must use the control systems given to them). AES Solutions provide School Machinery Servicing. See a case study of our School Machinery Servicing here. AES Solutions provide Dust & Fume Extraction services to businesses in the UK. AES Solutions provide both LEV Testing and COSHH Testing to businesses in the UK. Visit our main website for further information on LEV Testing UK and LEV Testing Case Studies. See our full range of products and services including Dust and Fume Extraction, LEV Testing, Workplace Cleanup Systems and Education Workshop Installations. 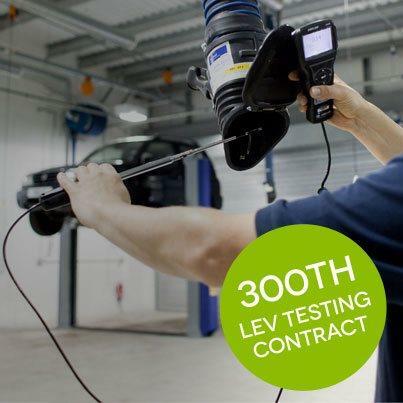 We have won our 300th LEV testing contract in Scotland! The latest addition to our client base is a heavy engineering company with sites in Glasgow, Edinburgh and Aberdeen. In addition to the LEV testing of the weld fume and grinding dust extract systems, we will be carrying out filter replacements for a range of Nederman extraction units.